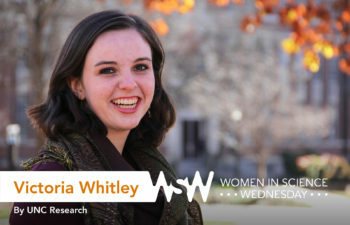 Junior Victoria Whitley is an undergraduate researcher within the UNC College of Arts & Sciences majoring in applied mathematics. She is also a research assistant in the Joint Applied Mathematics and Marine Sciences Fluids Lab. Her research focuses on understanding how some salts dissolve in corn syrup, causing stratified fluids to diffuse unevenly.